Recent research has once again shown that parents and guardians are the biggest influence on the choices that school leavers make. Whether your teenager already has their mind set on a particular career path, or they are open to all possibilities, you will best be able to support them if you are well informed about the options yourself. 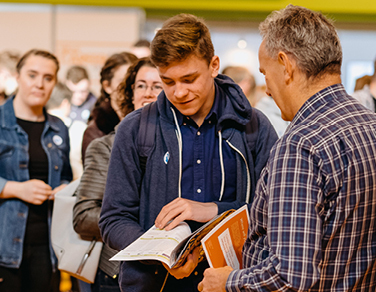 In this section, we'll be bringing you insights and advice from across a variety of organisations so that you can help steer your school leaver towards a path that most suits them. We have created a comprehensive Parent's Guide to Apprenticeships and University called Options. Find out more and buy a copy online here. We understand the importance of providing relevant information to parents to help you provide the best guidance for your school leaver at this critical time in their lives. We'd like your opinion on which topics matter to you most, in everything from building resilience, identifying mental health problems, using neuroscience to aid revision technique to improving interview techniques and helping your teenager to identify suitable careers... and much more! To help us tailor the presentation programme at the event to meet your needs and concerns, please complete this survey about which topics are most important to you and what you would like to learn more about.